After riding hot at the end of 2018 I’m off to an ice cold start to the year. It’s okay, losing streaks are a mathematical certainty and I don’t get too bothered about them these days. The bad thing is that I started running bad as soon as I doubled my unit size – the gambling gods indeed have a sense of humor. Unlike the last two events, I feel much more confident on my reads this time. Here are my breakdowns of the fights on UFC 234 I’m laying cash on. When Lando Vannata fights, it’s always a spectacle. Despite coming from a wrestling background, Vannata is primarily known as a flashy striker with a fantastic vocabulary of punches and kicks. Sometimes he gets tagged with his hands low, but he’s usually able to deliver an offensive onslaught in return. The main criticism of Vannata is his energy expenditure. Typically he would have excellent first rounds and then fade afterwards. To his credit, Vannata has mentioned this is something he’s been working on and his cardio looked better in his last contest – which was a back and forth war. Facing him will be Marcos Rosa, a very large lightweight that is quite simply, not very good. At range, Rosa is a reasonably proficient striker but he will still be at a disadvantage against a much smaller opponent. In terms of grappling, Rosa looks like he’s never trained wrestling or jiu-jitsu. He gets taken down extremely easily (as you may expect looking at his lanky frame) and offers little off his back. If Vannata chooses to shoot takedowns, this would be his easiest path to victory. I’ve got some action on Lando Vannata at -300 and think he should be a bigger favorite. Fighting out of the acclaimed City Kickboxing gym, Kai Kara-France is a savage striker. Both technical and explosive, the 5’4 New Zealander is a pleasure to watch as he weaves into range and throws hammers. While he looked dominant in his UFC debut against Elias Garcia, there were a few sketchy moments. He got dropped with a punch and caught in a triangle – although I was impressed at how he escaped. Looking at his earlier footage, it appears he’s worked hard on his grappling and submission defense. Paiva is a jiu-jitsu purple belt and likes to mix in takedowns with his striking. He might be able to ground Kara-France, but I don’t see him keeping the New Zealander on the mat or submitting him. In fact, I’m not really sure who has the grappling edge. On the feet, Paiva is scrappy whereas Kara-France is much more technical and I think that will be the difference here. I got in early and have Kai-Kara France to close a parlay at -200. The line has been steamed all the way to -300, but I think it’s still usable as a parlay leg. I thought Montana De La Rosa looked good against Rachael Ostovich. Her striking is still a work in progress but she’s developed a solid jab and can throw in combinations if she chooses. Her striking style appears to be boxing-centric. With that being said, I believe De La Rosa’s biggest advantage in this match-up is her grappling. She was an All-American wrestler in high school, is savvy from top position and will threaten with submissions. Her opponent, Nadia Kassem, may have potential but she looked extremely green in her UFC debut. On the feet, the Australian has a serviceable kicking game but doesn’t appear to be defensively minded. At range, I think we’re looking at the jab of De La Rosa versus the kicks of Kassem, and I’m not sure who has the edge. One major concern for Kassem is how easily she was taken down in her debut by Alex Chambers. This time she’ll be facing a much better grappler in De La Rosa who unlike Chambers, is not going to gas in the second half of the fight. Kassem can threaten with submissions from her back but I don’t think De La Rosa is likely to get caught. Another red flag for Kassem is that she’s spoken on social media about her battles with depression (which is no joke, by the way). Having dropped significant weight and spending days alone without eating, I’m glad she’s overcome her problems. Still, it doesn’t inspire confidence if I was looking to bet her. Ultimately I think we’ll see some close striking exchanges at the beginning of the fight and then a wipeout once De La Rosa gets her wrestling going. I got in early and played Montana De La Rosa at -200 but if you want to parlay her at -250, go ahead. Welcome to MMA hell: you’re facing an explosive pressure fighter with a granite chin, yet you lack the power to deter his forward momentum. This is the scenario that Sik-Jitsu prospect, Austin Arnett, will be facing this weekend. Arnett isn’t a bad fighter at all, he can box and threaten with submissions. I felt he had more than enough to beat Humberto Bandenay and I was happy to cash on him as a +200 underdog. However, he’s not the best defensively and is likely to get overwhelmed in this match-up. Like a few other fighters on this card, Shane Young fights out of City Kickboxing and is a ruthless barbarian. Against Rolando Dy, Young unleashed a relentless bombardment, finishing his Filipino opponent with strikes in the second round. I don’t think Young took a single step backward in that fight and I doubt he will here. I think we’re going to see Young deliver a beatdown this weekend. He just needs to make sure he doesn’t give up a neck or an arm during the chaos, because I see Arnett’s only path to victory as a submission against the run of play. I managed to get some action on Shane Young at -200 and believe he should be closer to -400. We have some flashy strikers on this card, and Sam Alvey isn’t one of them. That’s okay, Alvey has his own game and it works for him. A southpaw counter-striker, Alvey’s style is viable because of his excellent chin, impenetrable takedown defense and big knockout power. If you get caught with your hands low against the ginger power puncher, you’re taking a tap – just ask Marcin Prachnio. In the past, fighters who’ve had success against Alvey deployed an outside kicking game, but I don’t think that will be a factor here. Jim Crute looks like an interesting prospect. Although short for the division, Crute is heavily muscled and throws bombs. He puts a tonne of steam on his shots – which makes me question how his cardio will fare if he’s forced to strike for three rounds. In his last bout with Paul Craig, Crute showed off some solid grappling skills but I don’t think he’ll be able to get Alvey to the mat. On the feet, I believe the Australian has some defensive liabilities that Alvey will be able to capitalize on. I’m going with Sam Alvey at +110 as I favor him to win outright. No one stays on top forever. Anderson Silva was once the best striker in the UFC, but he’s definitely lost a step in the later stages of his career. Now 43-years-of-age and coming off a drug suspension, it’s hard to envision Silva rolling back the years and shutting down one of the best contenders in the division. I wasn’t sold on Israel Adesanya as a complete MMA fighter when he came into the UFC, but I changed my mind after seeing him dominate Brad Tavares (who I really rate). In that fight, his jab, stance switches and low kicks were a nightmare for his Hawaiian opponent. Adesanya also looked great in his first round dismantlement Derek Brunson. Ultimately, I think we’re looking at the best middleweight striker of our present era versus the best middleweight striker ten years ago. I have Israel Adesanya to close a parlay at -350 but there is little value left at -600. If I had no action on this fight, I’d take my chances with Adesanya by decision at +190 as Silva’s chin still looked good in his last contest. It’s crazy how much both of these two have improved since their UFC debuts. Robert Whittaker is a fantastic striker with great hands, blistering speed and deadly head kicks (that he can walk you onto). His wrestling has also developed a lot over the past few years and I believe he’s worked with the Australian national team. It’s worth noting that Robert Whittaker has spent 50 minutes in a steel cage with the animal that is Yoel Romero. Although winning both fights (by the skin of his teeth), he took a lot of damage and sustained serious injuries. If he’s lost a step or his chin isn’t what it used to be, he’s facing an opponent that can take advantage. Gastelum isn’t as sophisticated as Whittaker in terms of striking, but he’s effective with what he does. He throws a great 1-2 and covers distance quickly (which is useful as he is undersized for the division). With knockout wins over fading veterans like Vitor Belfort, Tim Kennedy and Michael Bisping, it’s obvious Gastelum can crack. Whittaker hasn’t shown chin issues but if someone is to score a knockout, I favor Gastelum who has a titanium chin himself. In terms of grappling, I’m not sure we’ll see much of it. 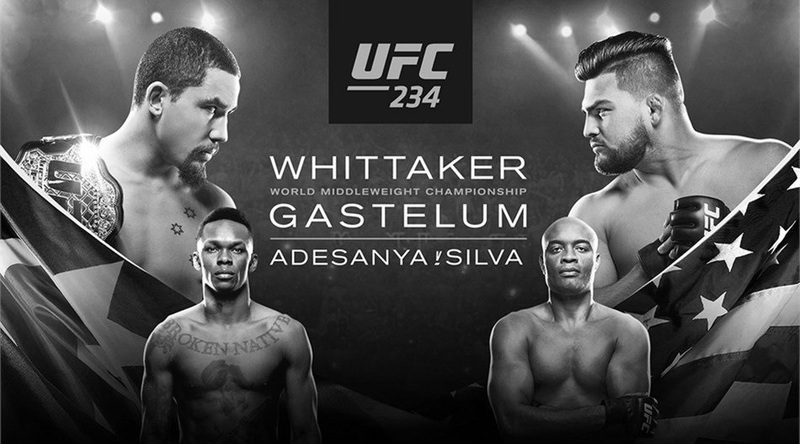 Whittaker has great takedown defense but rarely shoots offensively, while Gastelum can get taken down but is able to spring to his feet. My favorite play for this title bout is not Whittaker inside the distance at -150 (although the line has been steamed since I bet it). Gastelum is unlikely to get finished and could win the fight outright. You can also bet Robert Whittaker at the fantastic price of +100 as a special offer at Ohmbet. I got in early on a lot of these prices, but if you want to mix and match your own parlay with Shane Young, Kai Kara-France, Montana De La Rosa and Lando Vannata – go ahead. If you like money, check out my MMA Live Betting Guide.